The brain is a wonderful thing to stump. Do you like a good challenge? Have you ever won a staring contest? Do you consider yourself to have detective-level observational skills? If you answered yes to any of these questions, get ready for some eye-straining, brain-aching fun with Puzzle Baron's Picture Puzzles. + Solve 100 side-by-side almost identical picture puzzles by spotting what's different between them. 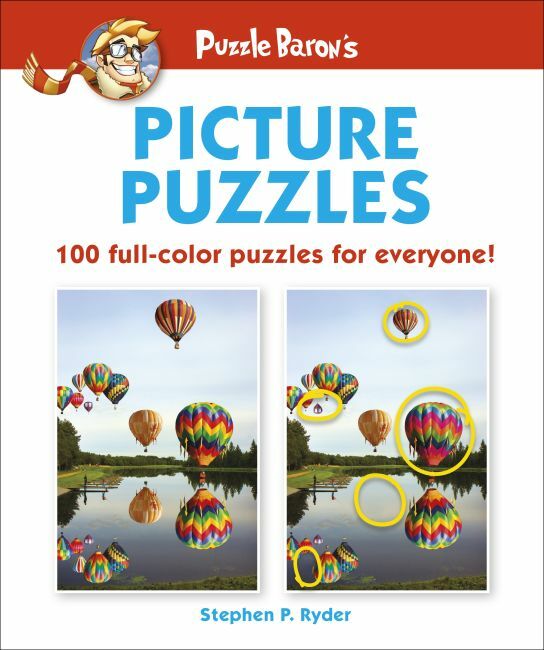 + Mix it up with a wide range of puzzles-from easy to "pack your eye drops; you're going to be here a while!" + Bring out your competitive side by checking your stats against the average completion time, record completion time, and the percentage of puzzlers who complete the puzzle. + Check you work against the visual answer key to see how observant you really are (or to cheat when the going gets tough!). + Enjoy countless hours of fun...just don't forget to blink! Stephen P. Ryder is the founder and editor of the Puzzle Baron network of websites (PuzzleBaron.com). These sites focus primarily on textual games and puzzles, including acrostics, cryptograms, logic puzzles, drop quotes, Sudoku, patchwords, and many more. The Puzzle Baron network serves more than 6 million visitors annually, along with an extremely dedicated user-base of more than 50,000 registered players who compete against each other for record scores and times. Stephen has published a total of seven puzzles books, including the best-selling Puzzle Baron's Logic Puzzles.